Beard trimmers are designed to trim hair on the face and neck using either rotating or oscillating razors. Electric trimmers are designed to trim the length of a beard, trim a moustache or remove facial hair completely. The hair trimmer razor is guided along the edge of the beard, and the hair is cut off near the skin to fall under a perforated shield of the razor. In this review we will discuss the best beard trimmers currently on the market. We will look at the types of trimmers available and the benefits of using one. We will explore corded versus cordless options and we will give you some information about what to look for before purchasing a beard trimmer. We will conclude which trimmer is the best overall option and which trimmer is the best value. By the end of this review, you’ll know which beard trimmer is right for you and have all the information you need to make an informed purchase. There are so many different types of beard trimmers on the market today it can be hard to know where to start when considering buying one. There are two main types of trimmers; corded and cordless. Cordless trimmers are either powered by batteries or are rechargeable, whereas corded trimmers plug into a wall outlet. There are also different types of beard trimmers for different lengths of hair, and different design features that help take care of stubble, shape sideburns and groom moustaches. Beard trimmers provide the best results when used on dry hair; wet hair appears longer than it actually is so cutting a wet beard might mean you cut off more than you intended to. It’s a good idea to comb your beard before trimming it to make your hair as straight as possible. Great for sensitive skin – if you have sensitive skin a beard trimmer is a great alternative to a razor which can irritate your skin quite badly. You can use a trimmer every day without irritation. Versatility – with the many beard trimmer options, you’re sure to find a great trimmer that you can use in a variety of locations. Flexibility – if you use a battery powered beard trimmer you will have the freedom to use this on the go which can be a lifesaver in this hectic modern world. Trimmers are quick and easy and you can use them just about anywhere; at home, in your car, even at the office which really takes the hassle out of your daily shave. Convenience – when you have a cordless version you will be able to shave when you choose and where you choose; you won’t be forced to stand over a sink each time. The convenience of cordless trimming means you’ll never leave home again with the frustration of forgetting to shave. Precision – beard trimmers can provide more precise trimming functions than electric shavers or hand-held razors. They can be used to trim and shape all lengths of hair around the face and neck area so you don’t have to sacrifice the shape and style of your beard waiting for a barber’s appointment; you can maintain it on a daily or weekly basis at home. So, while there might be an initial financial outlay you could end up saving in the long-term. Your first decision when buying a beard trimmer might be in choosing whether to buy a corded trimmer or a cordless one. Let’s look at the advantages and disadvantages of both types. The two main advantages to corded trimmers are they give you guaranteed power and are ready to use at any time. The downside is that you are restricted in terms of location as you need a wall socket nearby. If this isn’t an issue, and you want a reliable trimmer that won’t let you down, a corded trimmer could be the option for you. The biggest advantage to cordless trimmers are their flexibility. You can take them anywhere with you and shave in almost any location. 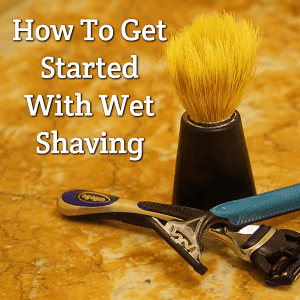 This is particularly important if you lead a busy, hectic life where your time is limited, or if you’re someone who often runs late and needs to shave on the go. With a cordless trimmer you have the freedom to shave in the car, in the office, at the airport, just about anywhere. The downside to cordless trimmers is the recharge time. They’re either dependant on batteries or they’re rechargeable – in either case they need time to recharge, and this could end up causing you inconvenience. They certainly offer the most flexibility but they could let you down if they lose their charge or run out of batteries. Here’s a quick summary of the main pros and cons for each type to help you decide which type is right for you. Corded/cordless – a key consideration when buying a beard trimmer is whether to buy a corded or cordless trimmer. A cordless trimmer gives you the flexibility of taking it anywhere with you, but you need to factor in battery run time and operating power. Corded trimmers give you guaranteed power at any moment but tie you to a particular spot for trimming. Both have pros and cons as discussed earlier so you’ll need to work out which is the best option for you. Battery type – if you’re looking at a cordless trimmer consider the type of battery it uses, how powerful it can operate, whether the batteries are rechargeable and how often they’ll need to be replaced. Battery runtime – if you’re considering a cordless trimmer you’ll need to consider the battery runtime – how often will it need to be recharged? Charge time – if you’re considering a corded trimmer you’ll need to consider what the charge time is likely to be; the quicker the recharge the better, especially if you live a busy life. Cord length – if you opt for a corded trimmer consider the cord length of the trimmer, and whether it will meet your needs depending on where you intend to use it. Beard guards – another consideration when buying a beard trimmer is how well the trimmer works with guards on and off, and how reliable the guards are? Function – another consideration when buying a beard trimmer is how well the trimmer operates in terms of its overall function: how does it handle quick touch-ups in easy-to-screw-up areas such as the lip and jawline? Dual voltage – this is handy if you travel and want to take your trimmer abroad. Some trimmers come with dual voltage, others come with European/US plug adaptors. No of length attachments – each trimmer should come with length attachments for various length beards. Consider how many you might need and whether it’s worth paying more for a trimmer that comes with more attachments, or whether one or two might do the job for you. Cleaning and maintenance – how easy is the trimmer to clean and maintain? Are there any hard to reach places, or any tools to make cleaning easier? Can it be washed clean? Construction – was the trimmer designed with user ergonomics in mind? Is it easy and comfortable to hold? Some beard trimmers are designed with an ergonomic handle, so you can use the trimmer at different angles with ease. Some have rubberised grips for a more secure hold. Weight – consider the weight of the trimmer: is it lightweight and easy to manoeuvre? Charging Light – many rechargeable beard trimmers have an LED charging light that indicates when the unit is charging and when it has reached its full charge. Some have a display that indicates battery percentage. Features – some beard trimmers come with additional features such as a memory feature that allows the user to set the trimmer to a particular setting, a speed control allowing you to adjust the speed to cut and shape coarse or thin hair, and a removable distance comb to style and clip different lengths of hair. Warranty – consider the length of warranty that comes with the trimmer just in case something goes wrong. Welcome to our Best Beard Trimmers review section. Here we check out the best models available for purchase. The Philips Norelco Beard Trimmer offers the flexibility of being able to use it corded or cordless. The unique feature of this trimmer is that it’s the world’s first beard trimmer with a built-in laser guide helping you create precise lines. It ranks highest in terms of price in this review and it’s this revolutionary technology that you’re paying for. 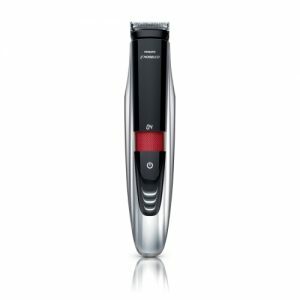 This trimmer offers a remarkable 17 length settings with as little as 0.2 millimetres between settings allowing you to achieve the exact length and look you desire. The Phillips Norelco 9100 is a dual-sided trimmer with a wide end for perfectly straight lines on your neck and sideburns, and a narrow end to style hard-to-reach areas around the nose and mouth. A handy feature of this trimmer is its adjustable wheel which automatically locks in your chosen length setting. It’s self-sharpening steel blades require no oil or maintenance and the trimmer is washable so you simply rinse it under the tap. The blades and combs have rounded tips to prevent skin irritation making for a more comfortable trimming experience. In terms of power, this trimmer runs on a Lithium-Ion rechargeable battery; 1 hour of charge provides 1 hour of trimming. This maintenance free, smart trimmer offers precision like no other trimmer in this review. If precision is what you desire this is the trimmer for you, but be prepared to pay a bit extra for it. The Wahl Lithium Ion is a multi-purpose cordless trimmer with the power to shave, cut, trim and detail. Featuring Wahl’s patented blade design and a series of heads and guide combs this trimmer allows you to do it all. Its high-performance blades, with their self-sharpening stainless steel and carbon steel finish, provide outstanding cutting performance. One feature really stands the Wahl Lithium Ion apart from its competitors and that is its run time which is 4x’s longer than standard rechargeable batteries, no other trimmer in this review comes close to that in terms of performance. Not only does the Wahl Lithium Ion offer 4 hours of run time between recharging, it also has a quick fix offering of 3 minutes run time for a 1 minute quick charge. This is handy if the trimmer isn’t charged and you just need a touch up. You can also charge this trimmer while you’re using it, and its smart charging LED indicator will tell you when it needs to charge and when charging is complete. In terms of design this trimmer couldn’t be more comfortable to use. The body of the trimmer is largely coated in rubber for enhanced grip which is easy on the hand. Its sophisticated slate finish stainless steel package provides quality that you can see and feel. This is the second most expensive trimmer in our review but it comes with the longest warranty and the most blade attachments. With its powerful motor, sharp and near-professional-level blades, it’s long-lasting battery life, and great selection of beard guides, the Wahl Lithium Ion has to be one of the most versatile and best beard trimmers for most people. The Philips Norelco Bodygroom Series 7100 is a cordless, all-in-one grooming system, providing a quick and easy shaving/trimming process. Designed exclusively for men who want the ultimate body comfort below the neck you can use it on any part of your body. What is unique about the Philips Norelco Bodygroom is it’s dual-end design which allows for both shaving and trimming. It features a unique 3D pivoting head at the top of the device which closely follows your body’s contours for a skin-friendly, irritation-free, shave. At the bottom end is a high-performance trimmer with cutting capabilities that provide refined grooming. Some nice features of the Bodygroomer are its maintenance-free, self-sharpening blades which ensure a precise, even trim and shave every time; its built-in trimming comb with 5 length settings which comfortably glide over the skin while trimming even the thickest hair; and its shave head which prevents nicks and cuts while capturing long and short hairs in a single stroke. 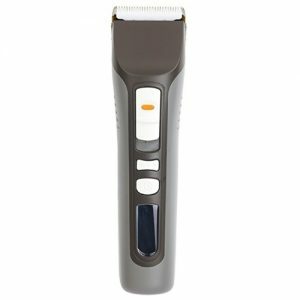 The water-resistant casing and materials mean you can use this trimmer wet or dry. The added convenience of being able to use it in the shower, and being able to clean it with water, are great selling points. A nice feature of this trimmer is its ergonomic design; its equipped with soft rubber side panels and buttons providing a secure, comfortable grip in both wet and dry conditions. In terms of power, a one hour charge gives you 50 minutes of cordless use, its LED battery indicator tells you its power status, and it comes with a foldable charging stand making it very convenient to use. If you want a versatile all-in-one, refined grooming system this is the product for you. The cordless Brio Beardscape is a solid and comfortable trimmer able to take on any challenge from beard to stubble thanks to its integrated 1.0 to 1.9 mm blade height adjustment. What sets this trimmer apart from its competitors is its ceramic blade which is 4 times harder than stainless steel; this creates less friction, less heat, and less noise than metal. It is an extremely quiet device. It comes with five speed settings and 2 length attachments, responsive controls and an informative display. In terms of size this is a compact cordless device. In terms of power, it might take a little longer to charge this trimmer than some of the previous mentioned trimmers in this review, but it’s extra-large Li-Ion battery gives up to 4 hours of runtime with each charge. This makes it the joint winner in terms of performance in this review. You can charge it in the base, or plug it in while you use it, and it comes with a long USB power cord so you can take it away with you. The Brio Beardscape is a solid, well-weighted, well designed trimmer that can power through any project with comfort and ease. If you want a quiet device that delivers on power then this is the trimmer for you. The Panasonic ER-GB60-K ERGB60 Precision Beard & Hair Trimmer gives you a clean, precision trim every time thanks to its 45° edge blades creating the optimal trimming edge. Panasonics beard trimmer blades are forged from hypo-allergenic stainless steel for irritation-free, comfortable shaving on any skin. Two great features are its ‘quick-adjust dial’ which allows you to easily find your ideal hair length and style, and its extensive choice of 39 trimmer settings for smooth, precision trimming. You couldn’t ask for more choice from a trimmer. In terms of power, this versatile trimmer can be used cordless or corded pretty much anywhere in the world. It can run for up to 50 minutes on a one hour charge or can be plugged into any AC outlet for longer use. It includes universal voltage for easy grooming while travelling. Its LED charge indicator tells you when its charging and displays the level of available battery power. In terms of maintaining it, cleaning the Panasonic electric beard trimmer is quick and simple. The trimmer cleans under running water and a convenient trimmer cleaning brush is included for on-the-spot blade cleaning. 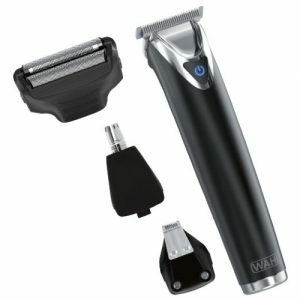 If you’re looking for a smooth, precise trimmer that offers choice and optimal trimming then this is the one for you. The Wahl Peanut Clipper/Trimmer is intended for professional use only and is designed to deliver the sharp performance that experts demand. This corded trimmer features a 7-foot, professional grade, chemical resistant cord. It comes with 4 comb cutting guides (1/8”, ¼”, 3/8”, and ½”), oil, a cleaning brush, red blade guard, and replaceable blades. This tiny trimmer really does pack a punch. It’s compact size and sleek design make this trimmer unique. Because of its size its very easily manoeuvrable and easy to pack away in a travel bag, and its dual voltage makes it the ideal travel companion. It’s lightweight and easy to grip fitting perfectly into your hand. It’s a stylish trimmer that offers professional precision and function. The Wahl Peanut might be small but it has all the power of a full-size clipper. It can plough effortlessly through 6 weeks of growth. Its powerful enough to give a smooth buzz and sharp enough to give clean lines. This trimmer has cutting power no rechargeable tool can match. Despite its power the Peanut is fairly quiet and doesn’t hurt your ears at all. If its value for money you’re after then the corded Wahl Peanut is the greatest value in a tiny, powerful little trimmer. Professionals like it, but it’s perfect for home use too due to how light and nimble it is. With its easy maintenance and durability, it’s likely to last for years. 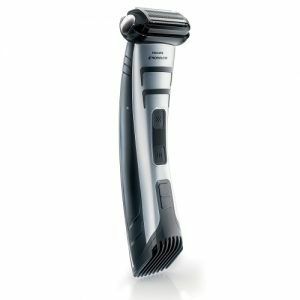 The cordless Braun Cruzer 6 has been designed especially for body grooming. It offers the unique combination of a powered body hair trimmer and Gillette Fusion wet body shaver for all-round body grooming. This unique combi-mode is like having two separate devices in one, and is what makes this trimmer stand out from the rest. At the switch of a button you can switch between trimming and shaving modes which allows you to trim and shave long hair in one stroke, taking the time and hassle out of shaving. This trimmer offers fast and convenient results allowing you to get on with your day. A full charge gives you 50 minutes of run time. This versatile trimmer automatically adapts to any voltage between 100V and 240V so you can take it anywhere in the world with you. 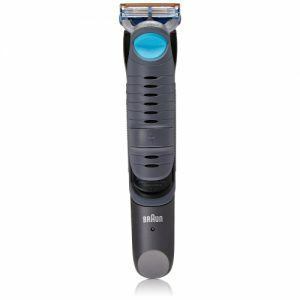 Thanks to its Gillette Fusion blades with their patented coating the Braun Cruzer 6 provides an incredible level of closeness and comfort. Its unique ergonomics allow you to comfortably shave all body parts and also tackle those hard-to-reach areas like your shoulders. Its high performance cutting system provides maximum precision and safety, and the three attachable combs allow you to cut hair to your preferred length. This trimmer multi-tasks like no other. Its versatility is second to none. If you’re looking for a trimmer that gives you flexibility, precision and control in your grooming then look no further. The Remington HC-5550 Chrome Precision Power Beard and Hair Clipper is an advanced grooming gadget. It offers professional quality cutting performance with its self-sharpening, titanium-coated, blades which provide maintenance free performance. It comes with two combs with an incredible 15 lock-in, no-slip settings, as well as a hair texturizer and stubble comb for facial styling. In terms of power, this trimmer offers the shortest run-time in this review, but where it lacks in run-time it makes up for with its ‘Turbo feature’ – a high-performance precision power DC motor with a powerful turbo boost. In terms of charging you can use this trimmer corded as well as cordless, and it boasts USB charging capability making it very portable. It also features an LED indicator charge light. This chrome trimmer is comfortable to hold thanks to its rubberized grip. Its ergonomic design gives you better control, and its reduced vibration gives added precision. Thanks to its exclusive Click N’ Wash feature clean-up is fast and easy. This trimmer is precise, comfortable, versatile and maintenance free. It gives you solid performance and professional quality results. 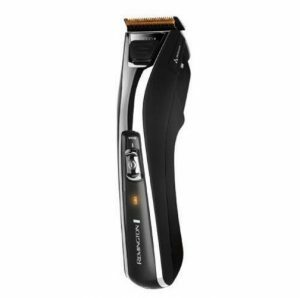 If you want to feel like a pro without paying the price this a great trimmer for you. Here we will look at the Best Overall Option and the Best Value beard trimmers. The Wahl Lithium Ion Slate Stainless Steel Trimmer #9864 is, in our opinion, the best overall beard trimmer of this group. It boasts an incredible 4 hours run time from just 1 hour’s charge – no other trimmer came close to that. It also features a super-convenient 1 minute quick charge for when you’re pushed for time and need a quick fix. It’s superior Lithion Ion+ batteries give you performance you can rely on. You can even use it while its charging which means its ready for you at any moment. 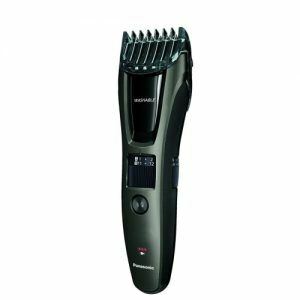 It comes with 4 attachment heads which only one other trimmer offered (the Wahl Peanut), a 5 year warranty giving you peace of mind if anything went wrong which only one other trimmer came with (the Remington HC-5550), and comfort and quality entwined. It might be the second highest in the group in terms of price but with its power and performance it would make a great long-term investment. 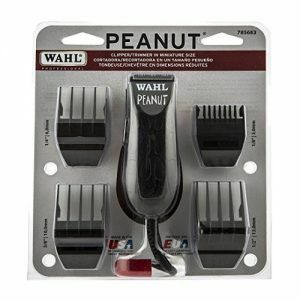 The Wahl Professional Peanut Clipper/Trimmer #8655-200, Black is the trimmer we felt is the best value of the group. Its size is the first thing to set it apart from the rest. It is light, nimble and very easy to use. It is small and compact and this is what makes it very manoeuvrable. While it is a corded trimmer its size makes it very portable. Its power is the second thing that makes it stand out. From such a small device comes incredible power and the ability to effortlessly cut through weeks of hair growth. It was designed for professionals but it is now dominating the home market too with its precision performance and durability. Ranking in the lower end of the price scale, this trimmer is incredible value for money. Thanks for visiting our Best Beard Trimmers reviews page. We hope you have found all the information you’re looking for and are now informed enough to make your new purchase.